Personal development and time management go hand in hand for all of us for as long as we exist in this time/space reality. The issue is – how to put first things first – how to even know what the first thing should be. All of our life is spent in the NOW. Yet how much of NOW do we spend being regretful or anguished about the past, or worried about the future? Answer (for most of us) – a lot! Let’s think a litle about changing that. 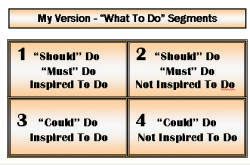 Do these quadrants give us a way of tackling the order of things? A. 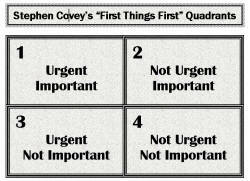 If we allow ourselves to be driven unconsciously by the “tyranny” of the urgent but (mostly) unimportant (Quad 3), then we’re condemning ourselves to more of Quad 1. B. The more time we spend in Quad 2 activities, the less we will spend later in Quad 1. So for the overwhelmed, it’s good information – make a chart of your To-Do’s and plan differently. But for most of us, it’s not the best model for organizing our lives because much of the time, we’re quite capable of putting off important stuff – be it urgent or non-urgent. In other words, we procrastinate. 4. Don’t Have to Do or Want to Do. Most of us don’t have a problem with Quads 1 and 4. If it’s Quad 1 we just go ahead and do it. If it’s Quad 4, we just never do it – no big deal. It’s Quads 2 and 3 where the issues arise because many of us gravitate to Quad 3 at the expense of Quad 2 – which means things that do have to be done, don’t get done. 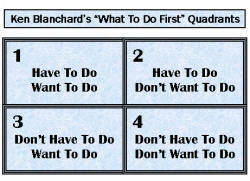 The Blanchard advice is to do them in the order Quad 2, Quad 1, and spend little or no time on Quad 3 items. To use this model, once again chart your To-Do’s and plan accordingly. You will be better “organized”. My problem with both of these time management principles is that, in my experience, none of us will continue to do things we don’t want to do unless we’re forced to do them. We may be forced by a boss. But if the boss is us, then unless we can get pleasure from the very knowledge that we’re now “organized” (and some can), we’re still not going to stick with it. If that sounds like you, then you’re normal and sane and you’re not weak and you’re not poorly disciplined – so get off that kick. And here’s the good news – you’re not condemned to have less in life than those mythical “other” “better organized” people out there! If you’ve considered the Blanchard quadrants, think for a minute about what determines why you would ever “want to” do something. Answer – because it’s fun, because it brings you joy, lets you feel good. I’m going to suggest we change the words “want to” to “inspired to” because it better describes what’s actually happening here. There’s a collaboration going on between you and your inner self – your inner being – that’s causing this feeling. And nothing nada, zilch, zip … is more important than feeling good. Now let’s look at the “have to” bit. I’m suggesting here you think about these as a collection of the “must” do’s and the “should” do’s. The rest are “could” do’s. Now segment your To-Do items and look at how many lie in each box. Starting from the bottom, Quad 4 is sort of a catch-all bucket for all sorts of things. There’s not much energy involved so you can safely ignore these items. Next let’s look at what’s in Quad 2. If you’re typical, you’ll have lots of entries here. You may find that this is where you hang out a lot. Quads 1 & 3 are where you need to be. In other words, in order to be truly “organized”, the task is to get the stuff in Quad 2 into 1, 3 or 4. You can work in Covey mode, or you can work in Blanchard mode. But if you really want to break out of the rut, your “work” is to change the way you think and get inspired. True time management and personal development means spending some time each day in quiet mode – either meditating (no thought) or visualizing what you want. If there’s no time in your busy day to do that – make time. This is your truly important task. And as you do, ideas will come. You don’t have to take quantum leaps. You don’t have to get yourself in a tizzy by quitting your job, or your relationship(s). If you spend quiet time, ideas will come to you, AND opportunities to take advantage of those ideas will come to you. In an easy and relaxed manner, your life will become what you’re visualizing. You must ask for what you really want. Don’t go back to sleep. The door is round and open. Don’t go back to sleep.